The product price includes 6 years' warranty and 180 day money back guarantee. The Pearl PFA-207ESU Alto Flute is a reliable and affordable instrument ideal for intermediate players. 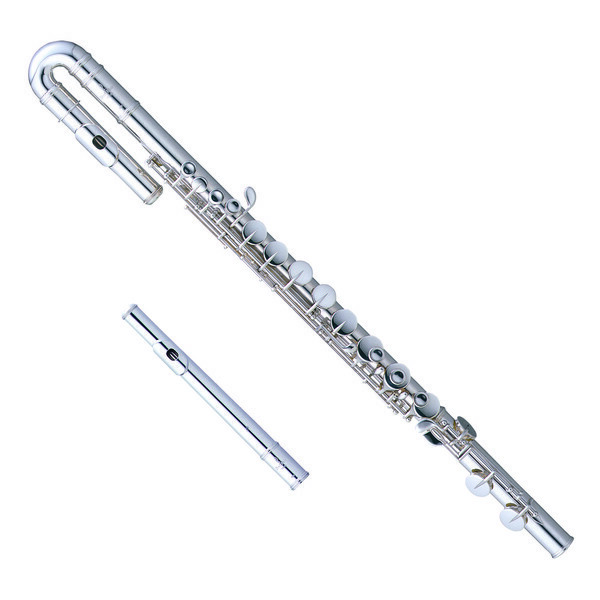 Featuring a Sterling Silver body with a choice of both curved and straight headjoints, along with Pearl's patented Pinless construction and One-Piece Core Bar, this versatile and responsive flute is the perfect instrument for younger learners as they progress through the levels. Mouthpiece - Ergonomically designed mouthpiece made from sterling silver for a comfortable feel in long performances and rehearsals. Core Bar - One piece construction for increased durability. Ergonomic Keys - Specially designed keys to offer grip and comfort across the playing surface. Pinless Mechanism - Prevents corrosion for long lasting durability. French Pointed Arms - Increase the stability for a consistent feel. Inline G - Comfortable feel ideal for traditional musicians. Curved and Straight Headjoint - Both options to fit your exact preference as you develop. The flute is made using Pearl's innovative Pinless construction and One-Piece Core Bar, providing it with an extremely comfortable feel, as well as preventing many of the usual wear and tear problems associated with traditionally made flutes. The Sterling Silver headjoint is curved to accommodate smaller hands, allowing younger learners to access all keys easily. The PFA-207SU also comes supplied with a straight headjoint for later progression, ensuring that the instrument will remain with the player as they grow.